The Johns Hopkins Institute for Clinical and Translational Research (ICTR) invites you to attend the Henrietta Lacks Memorial Lecture on Saturday, October 10, 2015, in Turner Auditorium on the Johns Hopkins East Baltimore (Medical) Campus. The keynote speaker is Dr. Ruha Benjamin, assistant professor, Princeton University and author of People’s Science: Bodies and Rights on the Stem Cell Frontier. Special guest presenters include Dr. and Mrs. Roland Pattillo, Morehouse College; Dr. John Joseph Strouse, assistant professor, Johns Hopkins School of Medicine; and members of the Lacks family. Copies of Dr. Benjamin’s book will be offered for sale and guests will have an opportunity to have their book signed. The 2015 winners of both the Henrietta Lacks Dunbar Health Sciences Scholarship and the Urban Health Institute’s Henrietta Lacks Memorial Community Award will be announced. This is a free community event open to the public. Parking, breakfast, and lunch are provided at no cost to attendees. Parking is available in the Washington Street Garage, 701 N. Washington Street, Baltimore 21205. Handicapped/disabled parking may be requested on the registration form. Registration is required. Early registration is advised as online registration will close prior to the event. Space is limited. Click here to download the event poster. For more information and to register online, visit: http://ictr.johnshopkins.edu/lecture. 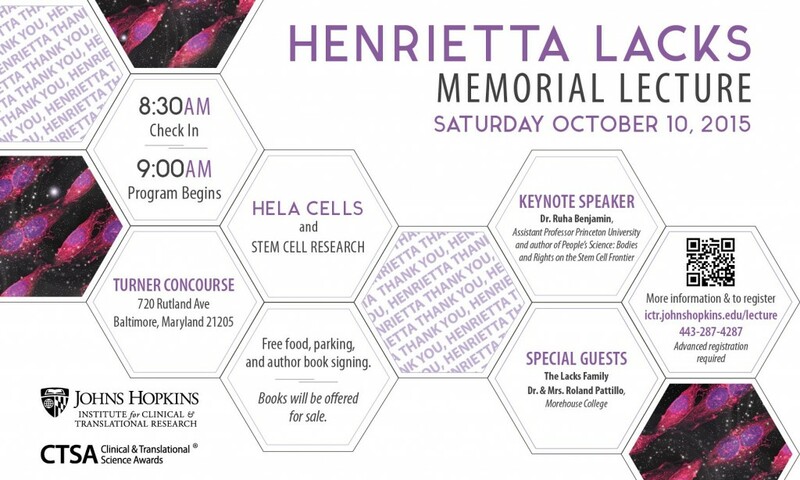 The goal of this event is to describe the reach and complexity, both biomedically and ethically, of the story of Henrietta Lacks and HeLa cells as well as to provide some insight into the past, present, and future of the conduct of clinical research. By honoring Mrs. Lacks and the positive global impact of HeLa cells through this lecture series, the ICTR hopes to acknowledge, thank and honor everyone who participates in the clinical research process.